The Forum (http://www.forum-bielefeld.com/) is a 5-10 minute walk from the Siegfriedplatz train and bus stop. The doors open at 20:30 and the band begins around 21:00. Tickets are 12€. Does anyone want to come? Living here for a relatively short amount of time has made it difficult to know what to invest in, and how much to invest. This was the topic of one of our Trailing Spouses meetings in the fall, where we discussed everything from getting more involved in the community to saving up for the future financial well-being of your family. However, in this post, I’m not talking about anything too deep. All I really mean is along the lines of: should I buy a spatula? Or is it worth it for me to devise my own scrambled egg-scraping device out of a plasticware top and some napkins, knowing that I will (or at least am planning to) be leaving the country in a few months? We are now living in our second of two furnished apartments and, needless to say, the term “furnished” is used pretty liberally here. We have an interesting hodgepodge of pots, pans and plates, most likely accumulated from previous tenants who have come and gone. We also found ourselves missing some essentials (big knife that actually cuts things thicker than butter? Yes, please). So what’s a trailing spouse to do when there’s no Wal-mart to be found? Here are some of the most promising places that I’ve found in Bielefeld where you can get the things you need for less. Tedi – A good place for those little kitchen essentials (ahem…spatula, anyone?). Kik – I almost cried when we wandered into this store for the first time. It’s like Big Lots, and anyone who knows me knows how I feel about Big Lots. I got a winter coat here when my to-be-shipped jacket went MIA. You can also get tons of things for the home here, which makes it a nice place to stock up on knick-knacks and wall decorations for temporary housing. Aldi – Ok, so I guess we have these in the U.S., but I’d never been to one, so I had no idea. It can be pretty hit-or-miss, though it’s a good place to go for some of the essential groceries. Plus, Aldi owns Trader Joe’s, so you get to experience the demented delight of seeing Trader Joe’s products translated into German. Lidl – A more established grocery store than Aldi, but still at low prices. They have an aged goat cheese here that will knock your socks off. As with Aldi, it’s fun to paw through the central “household good” bins and see what kind of oddities you come up with. These are just the ones that are important for the things that we need, and this is by no means the end of the list. For example, we haven’t been on the lookout for large items like furniture, but I know there are other places that sell home goods on the cheap in town. So, what did I miss? What other thrift stores or general good deals should a Bielefeld trailing spouse be aware of? The yearly artists’ open studios event takes place this weekend. For those new to the open studios weekend, this is how it works: You buy an open studios booklet for 2 euro at the Bürgerwache, Kunsthalle, Tourist Info office, etc. The booklet lists all the artists with examples of their work, along with a map so you know where to find them. You pick the artists you want to see and go visit their studios. Easy and fun! The event is this Saturday (September 1st) from 14-19h, and Sunday from 11-19h. My husband and I are festival people, and if there’s one thing Europe has, it’s lots of festivals! 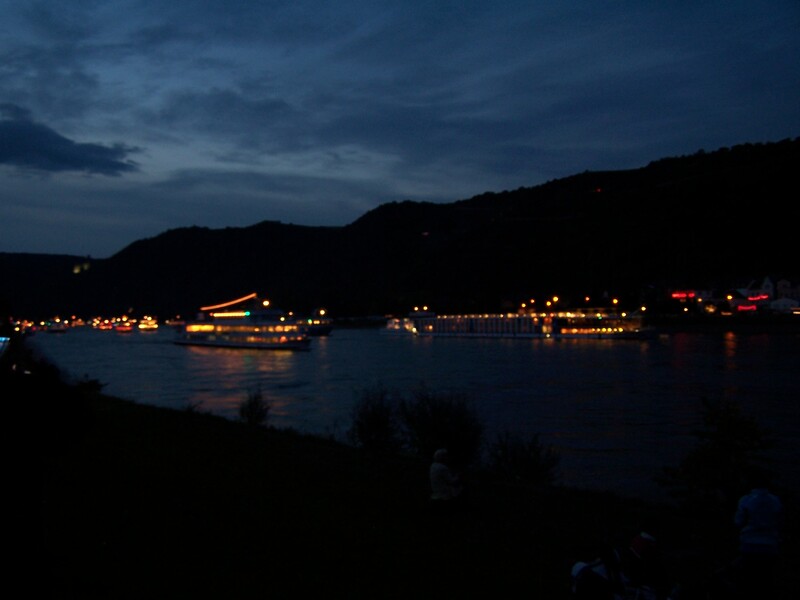 Last year we went to the Rhine in Flames festival in St. Goar. 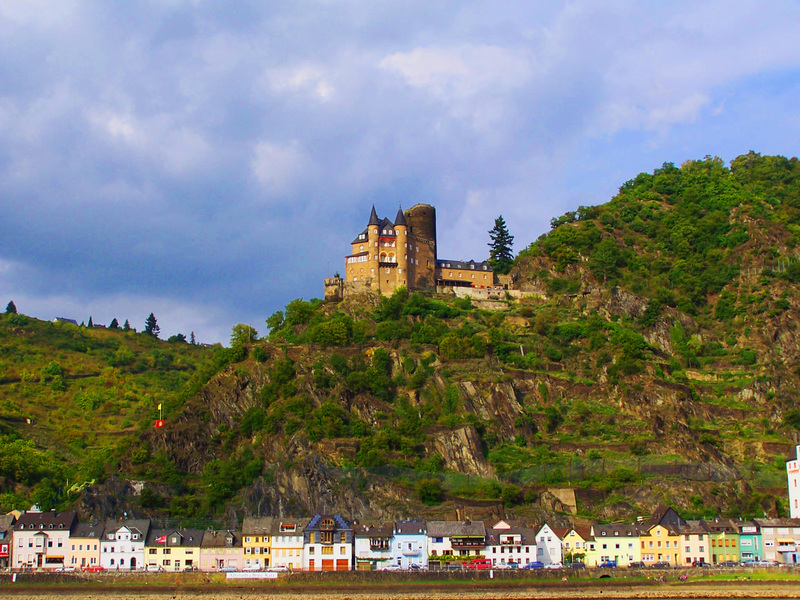 St. Goar is a beautiful little town on the Rhine river, right smack in the middle of the stretch of river with the highest density of castles….30 castles in 30 miles! 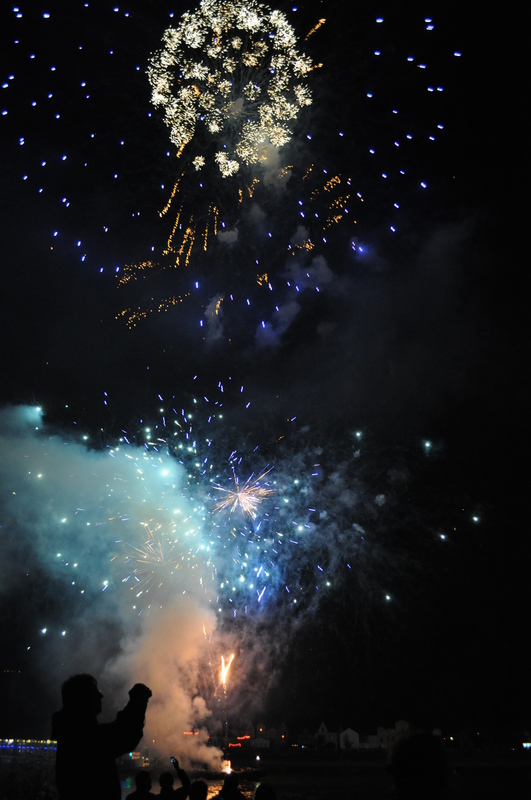 The Rhine in Flames festival is essentially an annual fireworks show. During the summer months, the festival begins on one end of the Rhine and moves every few weekends down the river, celebrating as it goes. At sunset, tourist ferries crowd the river, decked out in festive lights. That alone is a sight to see! A cannon in the darkness begins the festival! Castles on either side of the river simulate a midieval battle with fireworks. Barges on the river also shoot off fireworks. Italian food is loved everywhere, and no matter where you go in the world, there should still be a spot to get great, inexpensive Italian food. 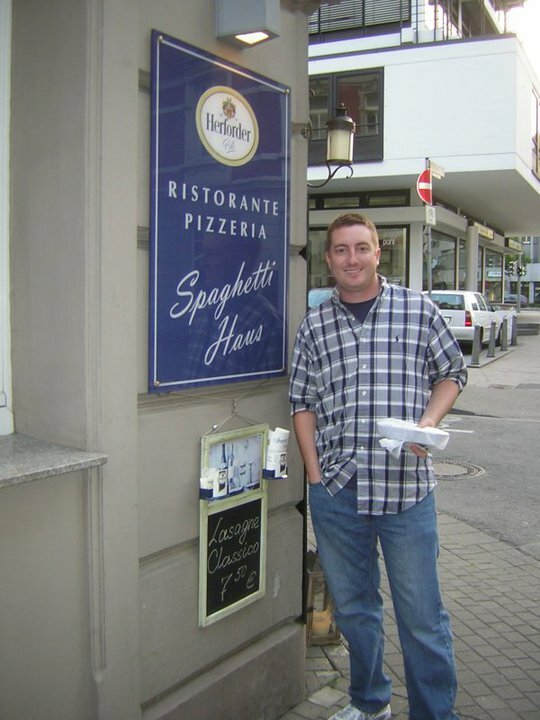 For us, the Bielefeld branch of great Italian is the Spaghetti Haus! Our favorite here is the ‘lasagne classico’, but everything is good! It’s inexpensive too, and the portions are large enough for us to take half home and eat it the next day (that’s definitely not a normal thing to do in Germany, and they might look at you strange for asking for a box, but I can’t help it! Some American habits die hard…) The restaurant is located right in the city center (Mauerstr. 13, 33602), you can check them out and even order on their website: http://www.spaghettihausbielefeld.de/ and they even deliver! One more perk….fluency in German is not required, because lasagna is universal!